A once in a lifetime opportunity to own a piece of history, a pre-WWII wine from the year of 1937. Ideal for an 80th Birthday. The wine comes with a certificate of authenticity signed from the winemaker and two of his sons. This German wine is still drinking well (Tasted March 2017) although it is not sweet like a modern German Auslese and it drinks surprisingly fresh. 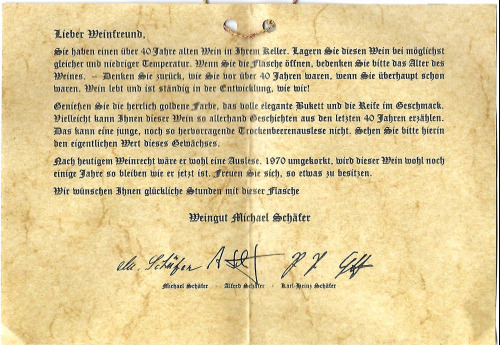 Email from Herr Alfred Schafer about the recorking clinic that took place at the winery in 1970.